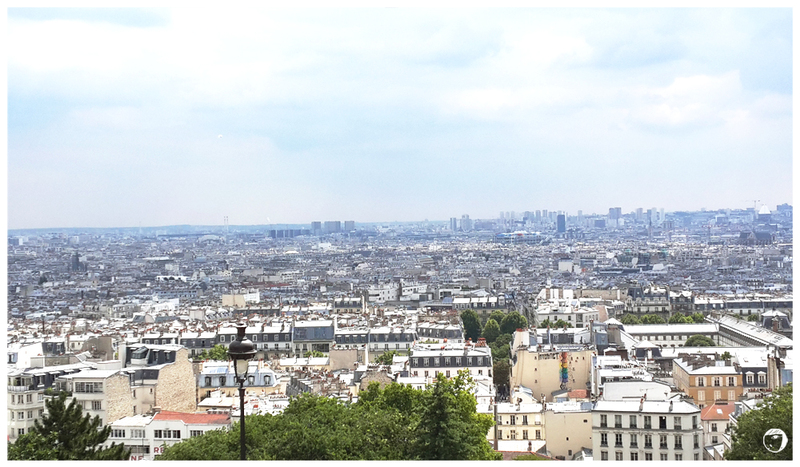 The Basilica is located at the summit of the Montmartre, a hill in the north of Paris. It is a minor Catholic church, but become one of tourist destinations in Paris because of its location at the highest point in the city. 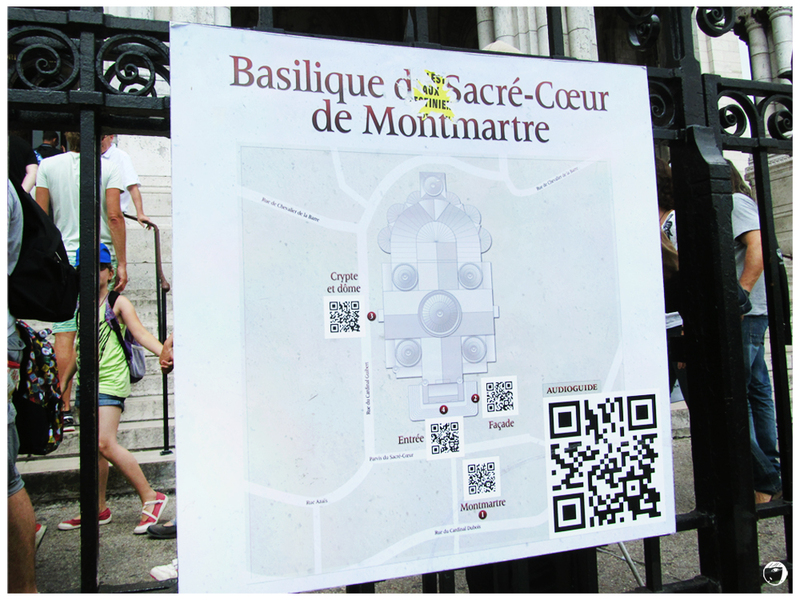 To reach the Basilica, visitors have to walk through a small street filled with mostly souvenir shops. Be careful of your belongings as there are many pickpockets around. I kept hugging my bag to avoid this to happen. Some pickpockets are smart enough to create some chaotic scenarios to distract the tourists attention. My advice is to be aware of those teenagers in groups. There is a legend behind the site of the Basilica. 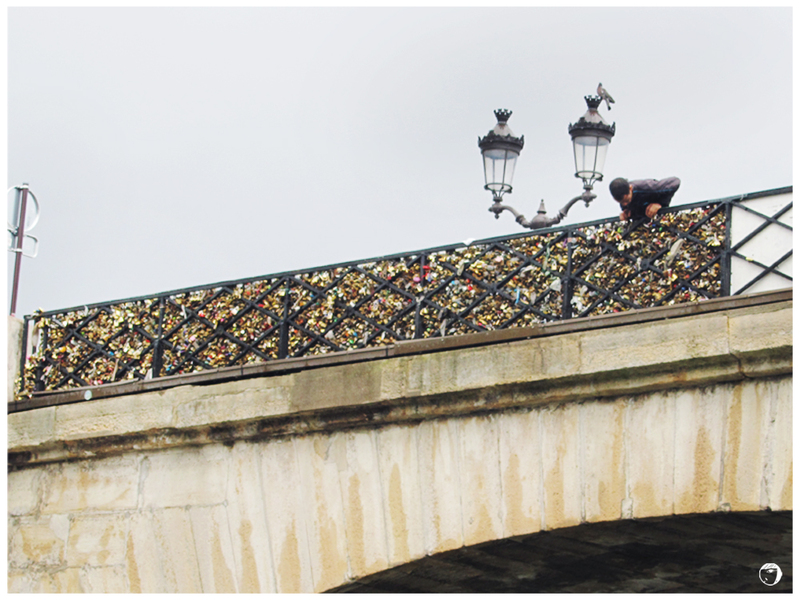 It is associated with the city’s patron, Saint Denis. He was martyred and beheaded. However Bishop Denis picked up his severed head and carried it to the top of the hill. The Basilica is built as a guilt offering and a vote of confidence to cure France’s misfortunes after France’s defeat in Franco-Prussian War in 1870 and the Commune of 1871. Visitors have options to go up the dome by climbing up the 234-step staircase or by a cable car. 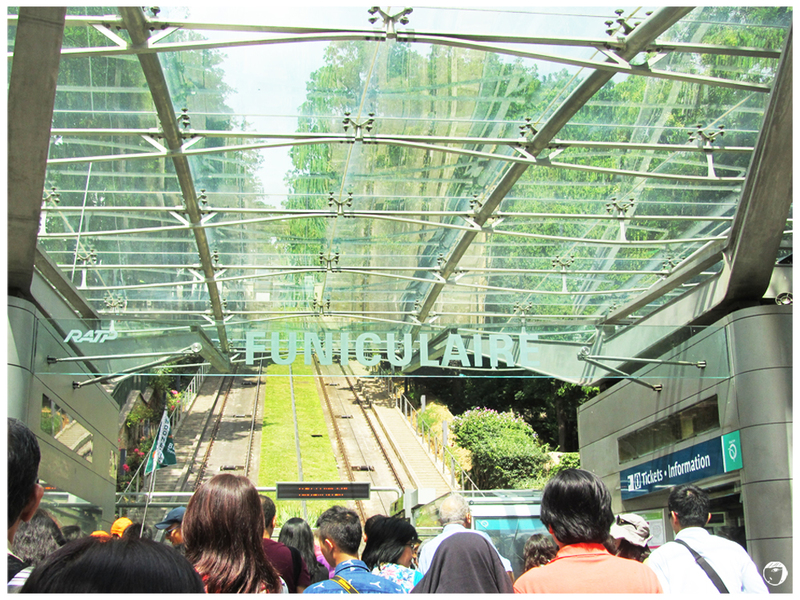 By taking the cable car, we have to buy the ticket. But it is more efficient especially for those bringing old people or children. The Sacré Coeur is recognisable by its architectural style which is Roman-Byzantine. Inside the building, the ceiling is decorated with the largest mosaic in France measuring about 480 m². As the church still actively used for mass services and praying, visitors are required to keep the noise down and no photographies are allowed inside. The view from the Basilica is breathtaking. 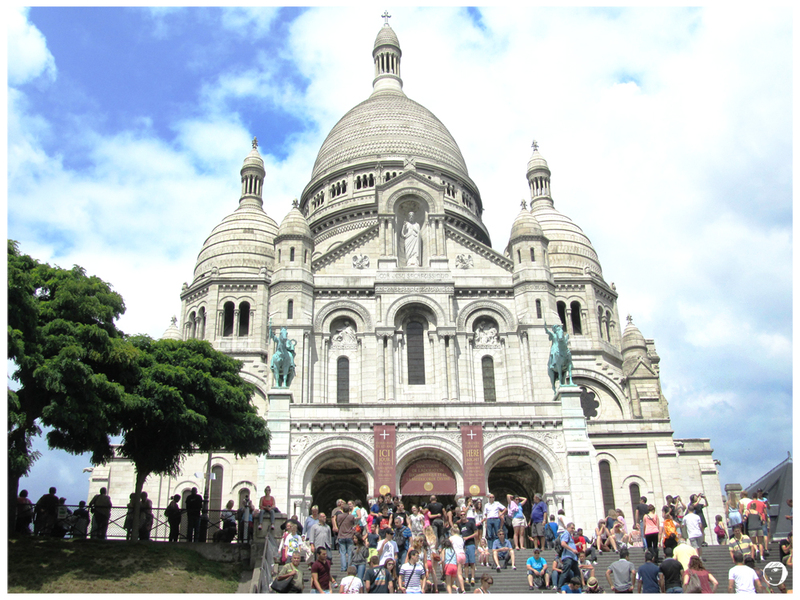 Due to its location on the Montmartre hill, even higher than the Eiffle Tower, the Sacré-Coeur Basilica has become one of the most noticeable landmarks in Paris. Once I stepped into the most populated city in the Central Switzerland, Lucerne, I immediately fell in love with the city. The ancient town mixed embedded within breathtaking mountainous panorama. The culture is more laid back as the locals value the quality of life. The most recognisable landmark in town is the Kapellbrücke, or known as the Chapel Bridge. The covered wooden footbridge bridge is one of Europe’s oldest wooden bridges and it was built across the Reuss River. The bridge is connected with its Water Tower (Wasserturm). It was not functioned as a water tower, but the name came from the fact that it is standing in the water. In the evening, the neighbourhood surrounding the river transformed into an exciting hang-out place. The restaurants and bars along the river side are always crowded by the locals and tourists who have their dinner or simply have a drink while enjoying the view. The whole settings slightly reminded me of Singapore’s Clarke Quay. Switzerland is about watches, swiss army knives and chocolate… The city centre is located just behind the river. There, shoppers can find the famous high-end Swiss branded watches (such as Tag Heuer, Rolex), boutiques, souvenir shops or cafes. Another famous landmark is The Lion Monument. The dying lion statue was carved out of natural rock to honour the Swiss soldiers who were massacred during the French Revolution in 1972 at the Tuileries Palace in France. 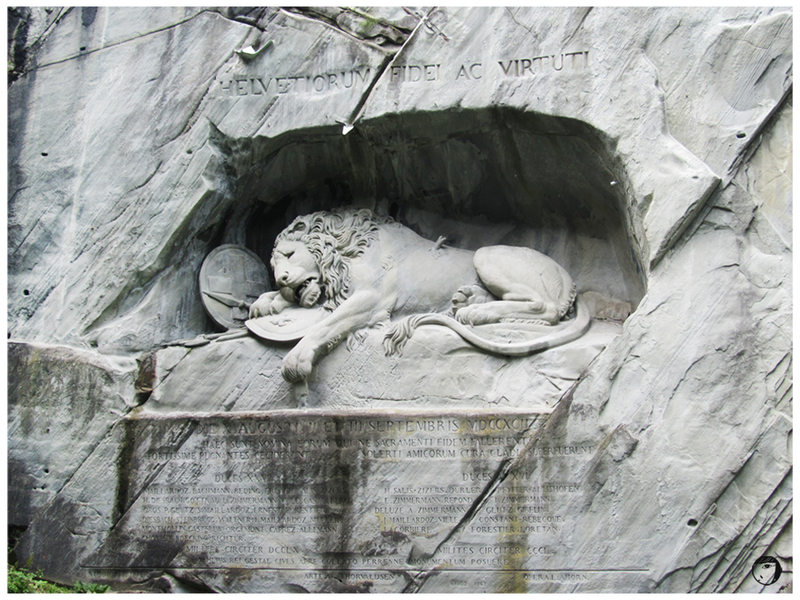 The Lion Monument is described by Mark Twain as the saddest and most moving rock monument. 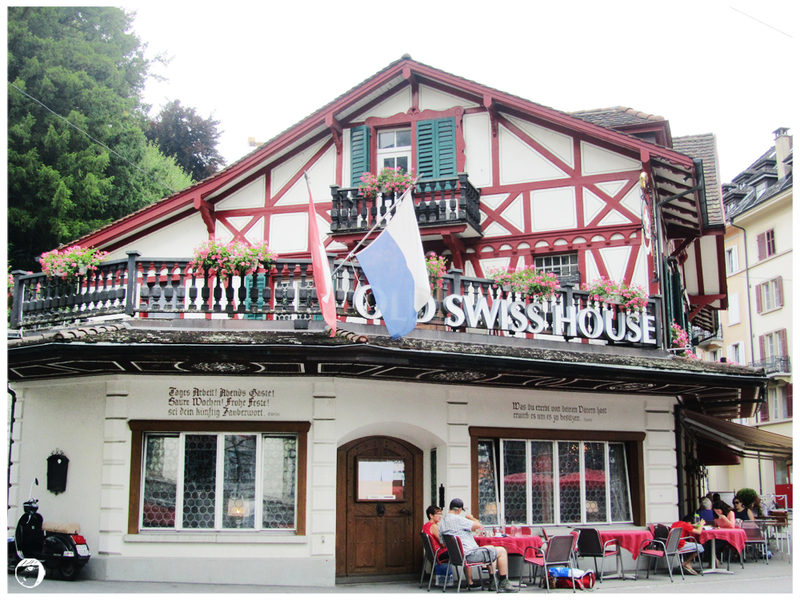 Just before you reached the Lion Monument, you will pass by this Old Swiss House, which is the most expensive restaurant in Lucerne. It is a family-owned Swiss restaurant that looks like a cottage from the outside but boasts a lavish decor inside. According to the review, their specialty, must-order menu is Weiner schnitzel. 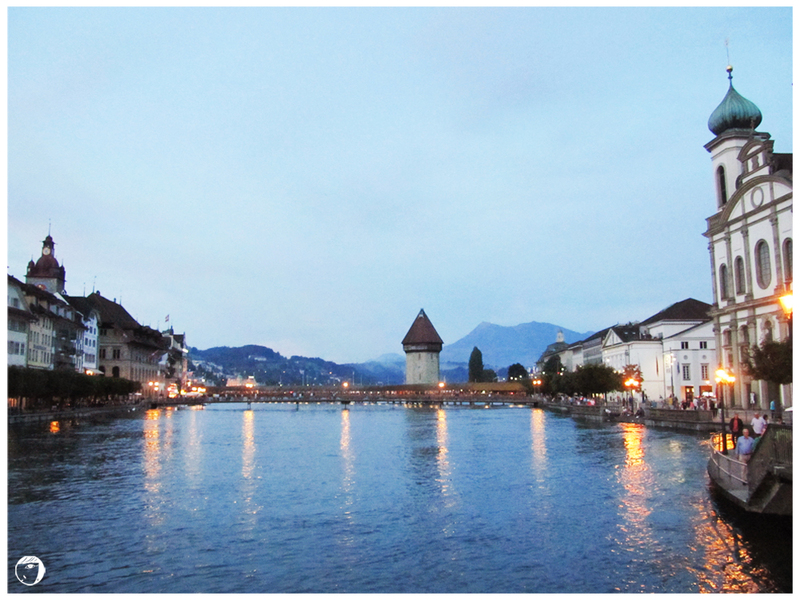 Lucerne is stunning, a center of Swiss history and legend. It is a friendly and safe city, when you compare with other cities in Europe. Women can move almost anywhere at night free and carefree, adding another reason why the city is one of my favourite Europe destinations. 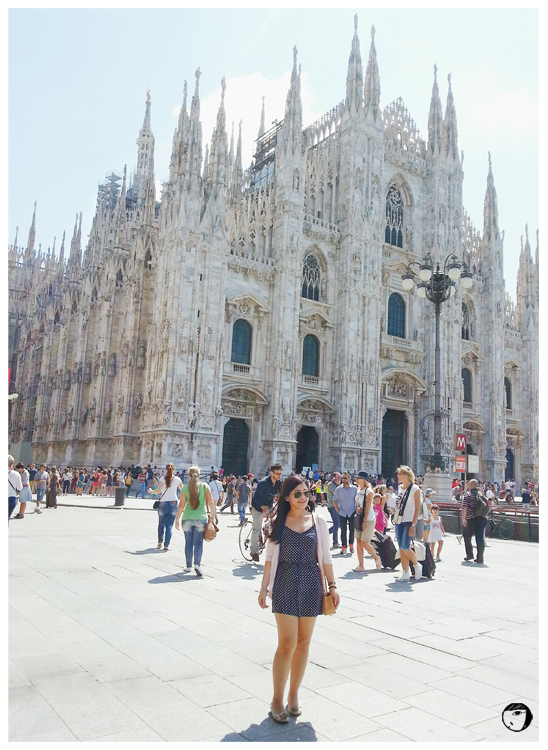 Milan is about Piazza del Duomo, one of the major landmarks in the city. The setting is rectangular, with a vast area about 183,000 square feet. 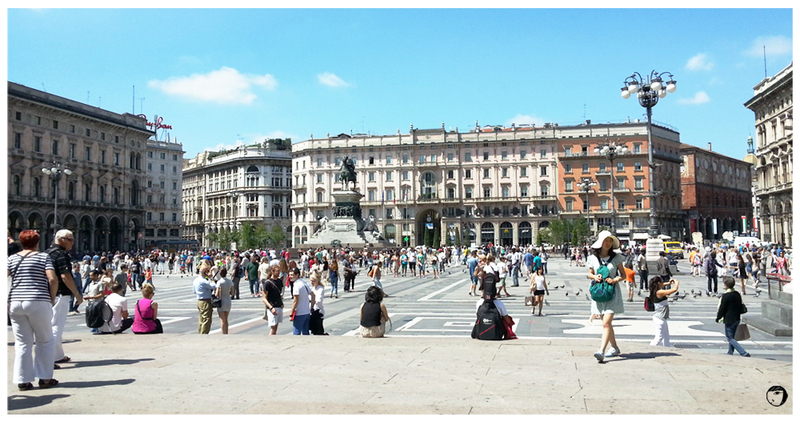 The piazza is by far the foremost tourist attraction of the city. 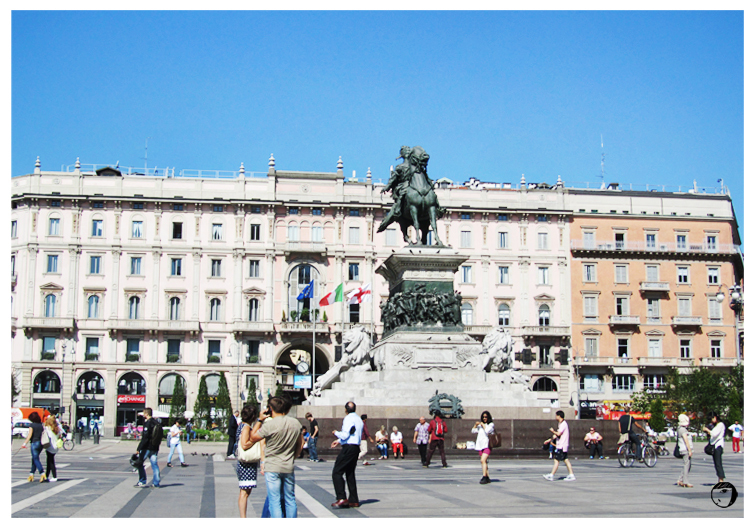 In the centre of the square, the statue of the first king of Italy, Vittorio Emanuele II stands impressively. 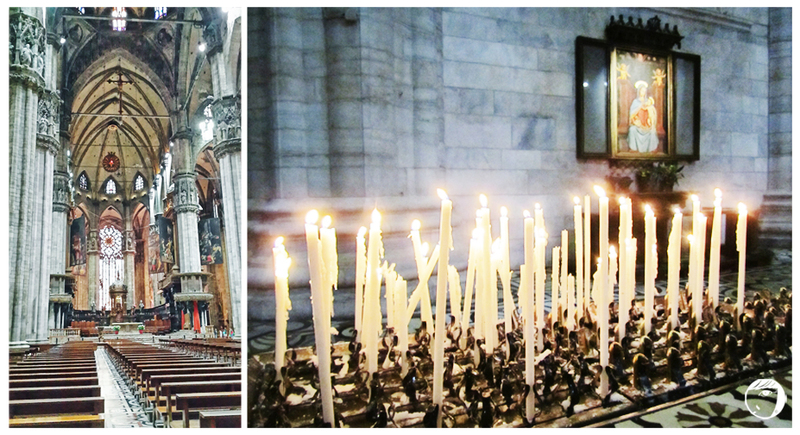 Milan Duomo is the fifth largest cathedral in the world, displaying a flamboyant Gothic architectural design. Although the construction started since 1386, it was dragged on for centuries and was finally completed in 1965. Many architects were involved and the original design kept altered, but the final outcome was surprisingly homogenous Gothic design. The Milan Duomo is free to enter, but you’ll need to pay a fee if you want to enter the Treasury or Crypt (located inside the church) or access the rooftop (elevator and stair entrances located outside the church). The interior is expansive but rather low in light. Visitors are expected to keep the noise level low as there are people who come here to pray. An important thing to note for those planning to enter the cathedral is the dress code. There guards at the doors strictly check if your dressing covers your shoulders and knees. Initially I was not allowed to enter, but luckily I had my scarf with me. I just need to wear my scarf around my waist, like a sarong. I would advise you to be careful of the street vendors offering birdseed for feeding the pigeons. It is a way to steal while you’re distracted. Another favourite trick is to ask you to break a large bill. The bill they give you in return is usually counterfeit, but by the time you realise, they’re already gone with your money. Or, even offering help to take photos, but run away with your camera. 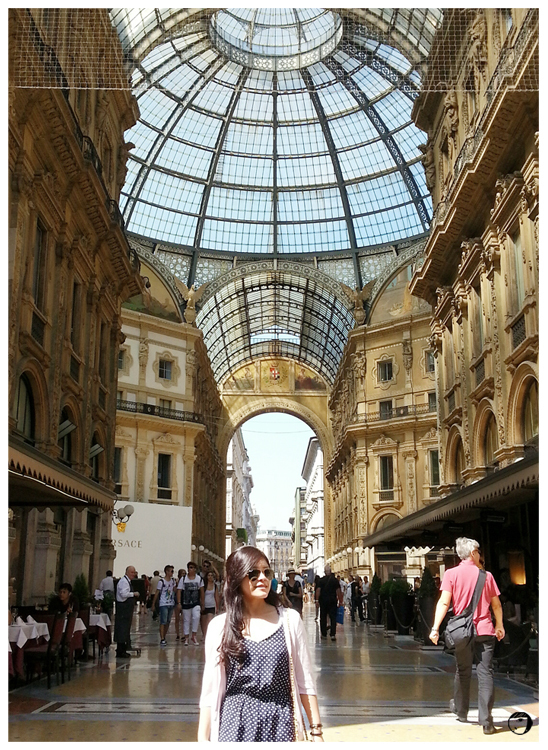 City of Milan is about lifestyle and fashion. Despite of being one of the most ancient cities in Europe, Milan remains the centre for high-end fashion, all about fashion designers, supermodels and international paparazzi. I’m pretty sure that everyone knows about the Leaning Tower of Pisa, one of the wonders of the world. The world-famous landmark is located at Pisa, a small city in Italy. 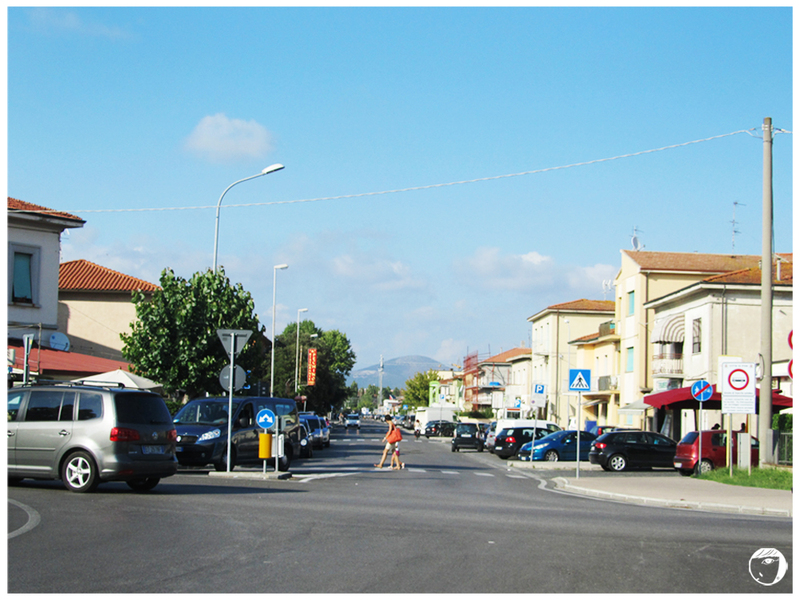 Being more famous as an university town, the city is very simple and quiet. Tourists go to Pisa mainly to visit the leaning tower which is located within the square of Piazza dei Miracoli or Field of Miracles. The whole complex is an UNESCO World Heritage site where you can also find the The Pisa Baptistry of St. John, the Pisa Cathedral, and the Camposanto Monumentale (Monumental Cemetery). To reach the the square of Piazza dei Miracoli, we have to board the special bus from the bus terminal. You may need to queue up to ride the bus as there are many people from all over the world visit the place daily. As I entered the complex, the first building was the The Pisa Baptistry. It is the largest baptistery in Italy. The building in the middle is The Pisa Duomo or Pisa Cathedral. The cathedral is a masterpiece of Romanesque architecture which dominates the monumental Piazza dei Miracoli. The last landmark is the Leaning Tower, the main attraction among the three magnificent landmarks. The Leaning Tower was initially built as a bell tower during Europe medieval era. However, in the middle of its construction, the tower started to lean soon afterwards due to subsidence of the ground underneath its base. Tourists were seen everywhere, busy posing in their most creative ways. Not a few would lay down on the grass or climb up the fence to get the best pictures. So how far did I do to get mine? For those who wanted to climb up, the tower was reopened in 2001. It is recommended to reserve or buy the tickets online in advance. The ticket can be bought at €18 (the price maybe changed). You can purchase the ticket on the day, but be prepared to wait for hours or the tickets might be sold out. Good news come for you who will visit the city before January 2015. Starting from the month of May 2014 to January 2015, there will be an exhibition by Polish artist, Igor Mitora, displayed. The exhibition includes about a hundred works, with sculptures, bronzes, cast-iron works and drawings by the artist. 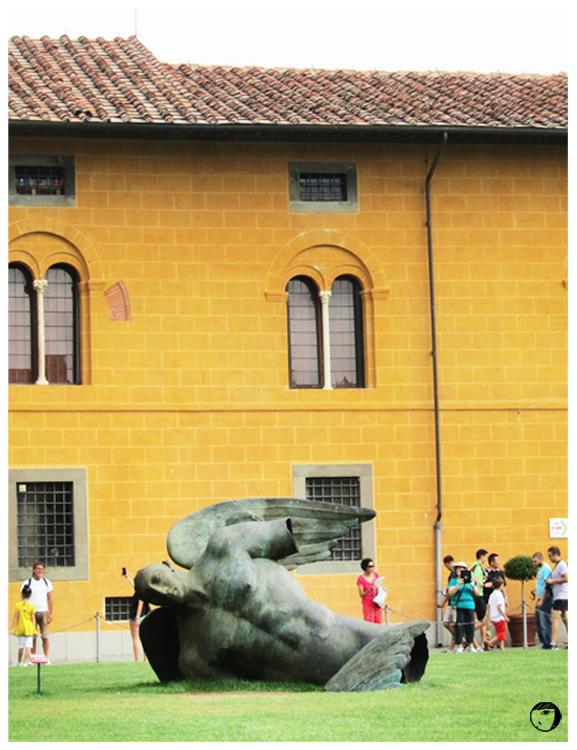 Example of one of the artist’s work is the fallen angel statue below. 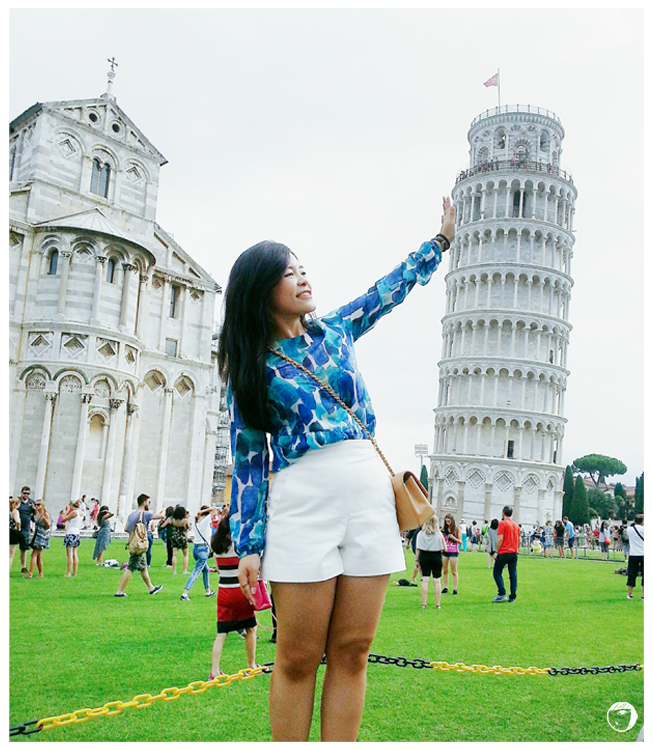 It was truly an experience to be able to visit Pisa and see the Leaning Tower with my own eyes. More over, Pisa is a safe city where you do not need to worry about your safety. Of course, it’s good to watch out for pickpockets especially in the touristy areas. 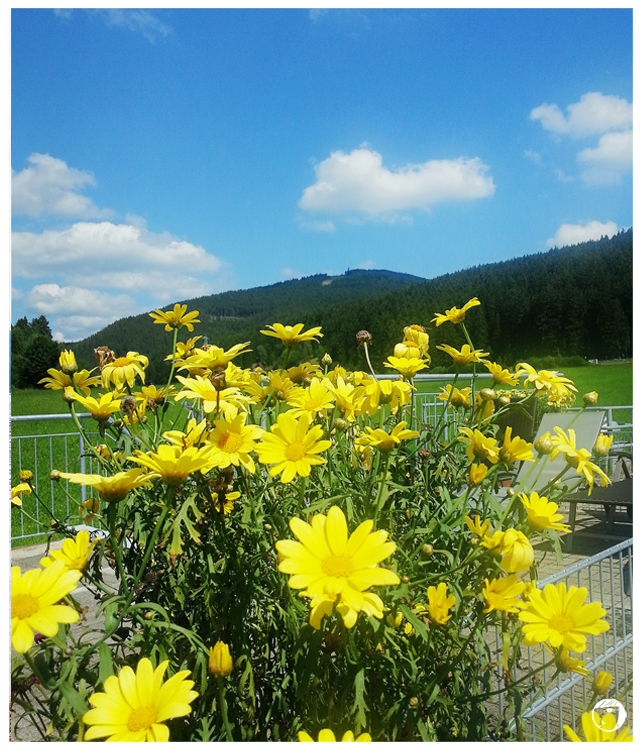 After Frankfurt, the road trip continued to the southwestern of Germany, where Black Forest (Schwarzwald) is located. Why is it called Black Forest? It gets its name from the scenic dark canopy of evergreens, mostly consists of pines and firs. Is this Black Forest related to black forest cake? Indeed. The world-known cake is originated from the region. The authenticity comes from the chocolate sponge layer, cream, local cherries and Kirschwasser with a noticeable cherry spirit flavour. Covered with cream and decorated with cherries and grated chocolate, it tastes even more extraordinary. 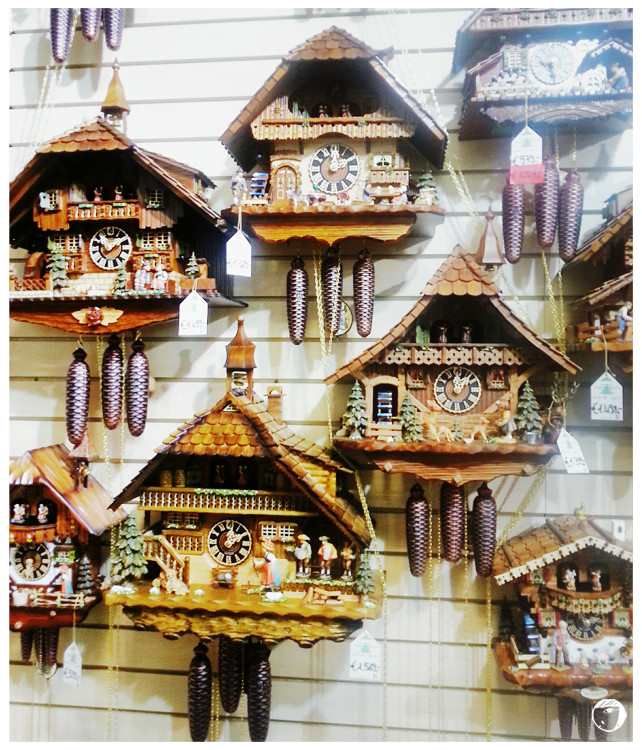 The regional speciality is not limited to Black Forest cake, but also its cuckoo clocks. The pendulum-regulated clock is manufactured in the Black Forest. 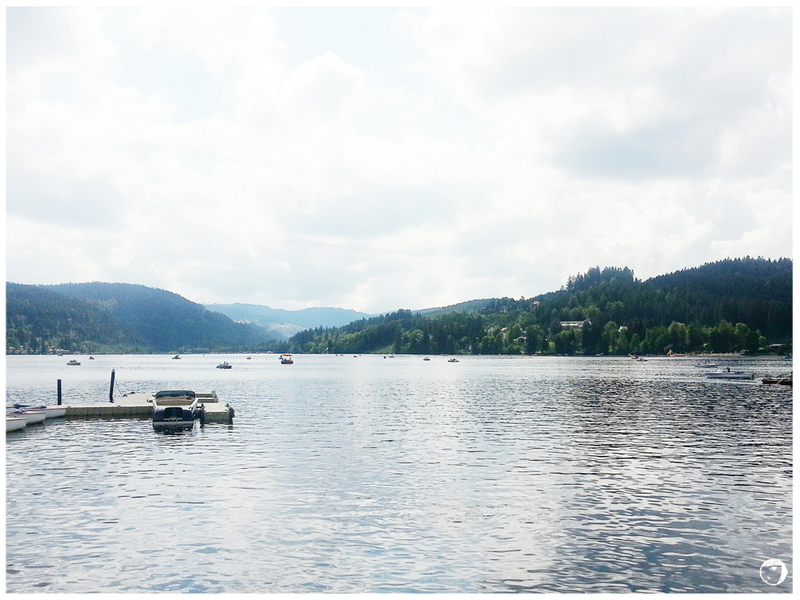 The most popular spot to visit is the Lake Titisee. 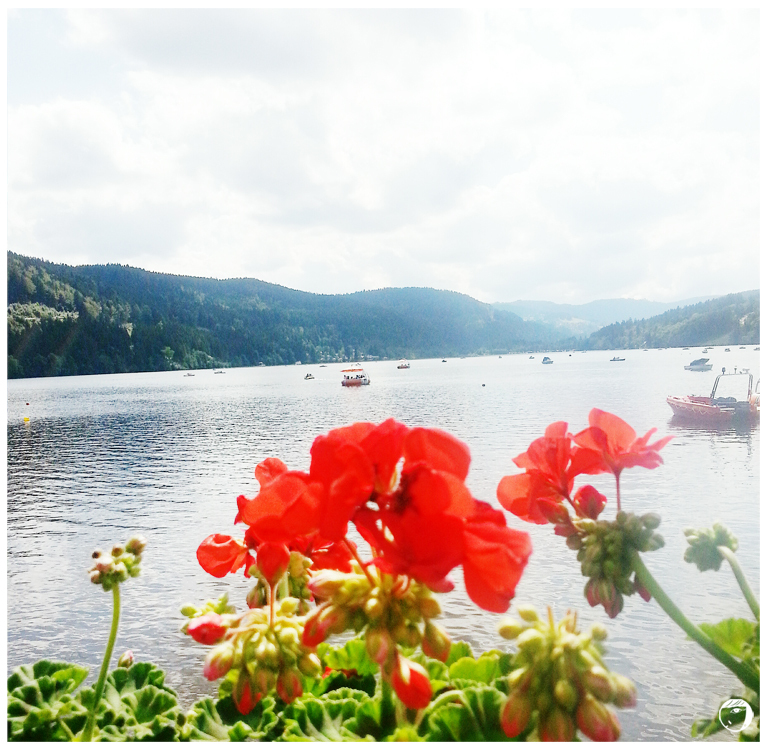 Located in the southern part of Black Forest, Lake Titisee is a beautiful, picturesque lake with its crystal-clear water. Although it is a tourist village, don’t expect those hustle-bustle tourist activities. Generally, visitors come to do relax and healthy activities such as water sports, rent boats and sail the lake on your own or take a tour on a large boat. The area surrounded was revamped as a waterfront promenade with shops and restaurants along the street. You can take a seat at one of the cafe for hours, thinking nothing but enjoy the marvellous setting of the lake. Forget about the negativity, breathe in the positivity of the surroundings. 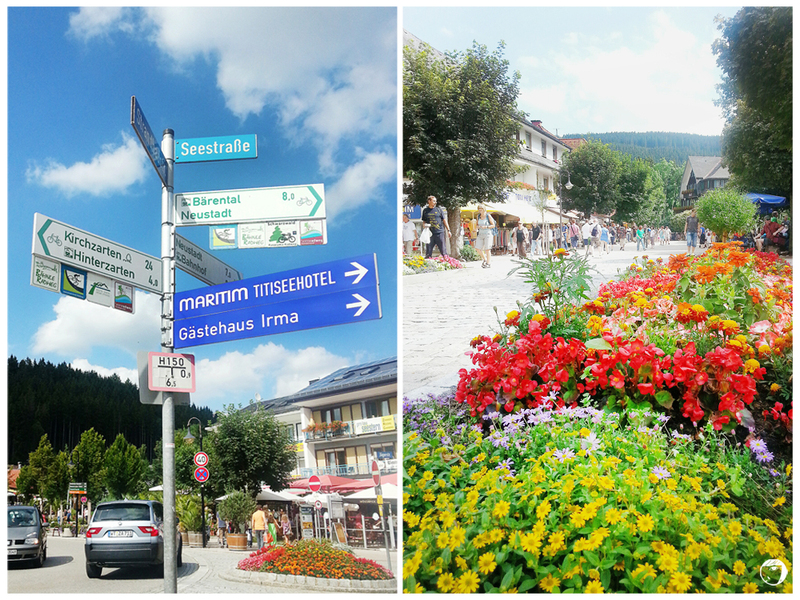 Kids chattering, people strolling with their dogs by the lake… If you are like me, enjoy watching these different emotions, you will love visiting Lake Titisee. Frankfurt airport is among the busiest in Europe. That explains why I visited Frankfurt 3 times during this year EU trip. Twice for transits and change flights, and once for a city tour before moving on to my next destination to Swiss. 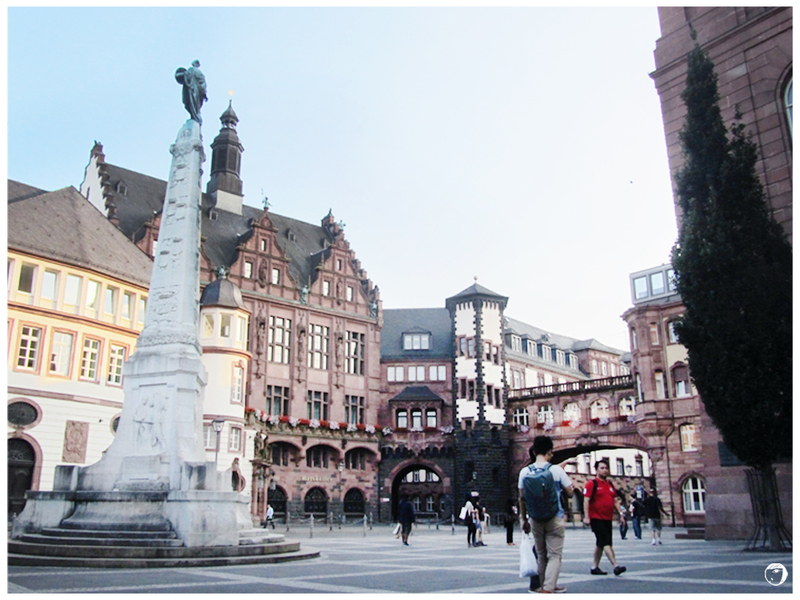 Frankfurt is a city of contrasts. Modern Frankfurt displays most avant-garde skyscrapers, some are the highest in Europe. On the other hand, some neighbourhood still maintained the old buildings from 19th century. Forget about seeing the modern side of the city, the old city offers more things. One of the city’s important landmark is the City Hall or The Römer, a medieval building in the old city (called the Altstadt). Opposite The Römer, is the Old St. Nicholas Church. The area is very touristy but there are a lot to see and do. You can walk around admiring the beautiful buildings or shop for souvenirs. But what I will recommend is to try the local food or beer at the cafes, bars or restaurants around. Beer has played a major part of German culture. I am not a beer-person, but it would be a great experience to try the local beer. 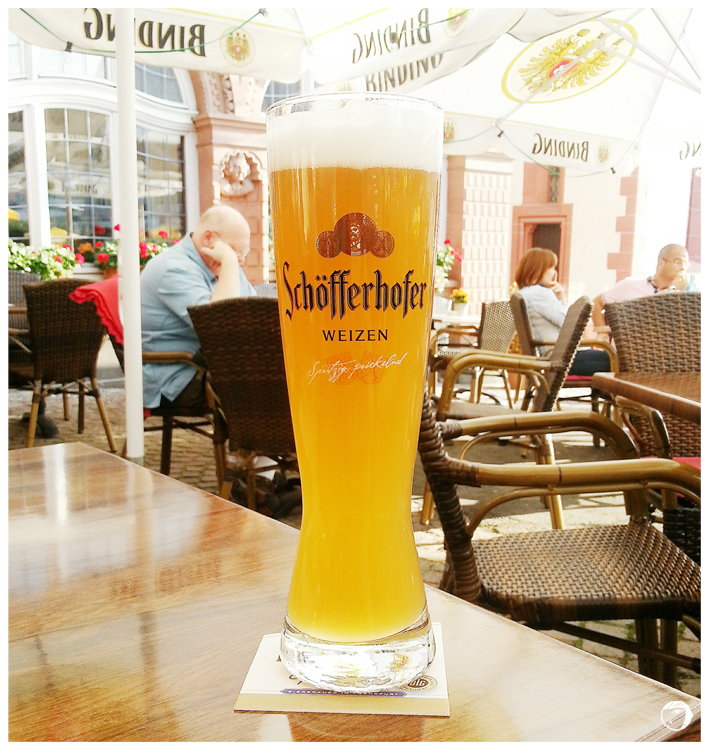 I had a glass of Shöfferhofer Hefeweizein, on the nose was creamy banana with gentle clove hints and in the mouth was smooth, soft, drinkable and easy for a non-beer person. Done with the local drink, moving on to the local food. Germany are famous for their meat and sausage. 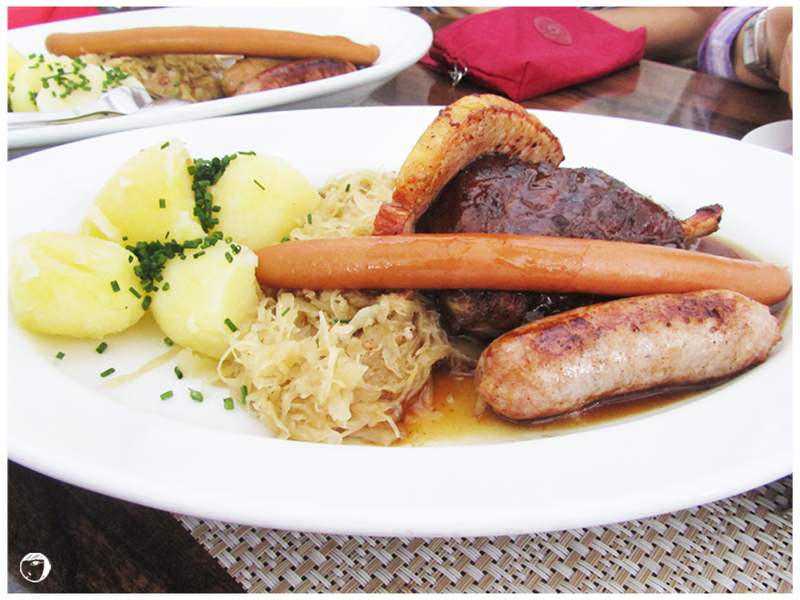 Pork knuckles and Bratwurst (sausage), most popular and most common local food that worth for trying. Usually the portion comes with side dishes such as boiled potato and sour cabbage (called Sauerkraut). The square is only 2 minutes walk from the beautiful Main River. It’s the longest river flowing all in Germany. 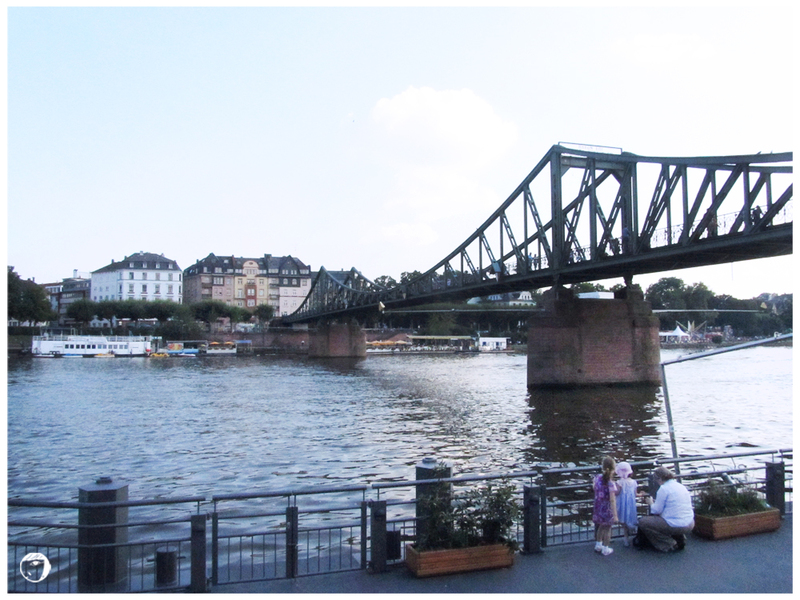 Over the river, the Iron Bridge (Eiserner Steg) serves as a pedestrian walkway connects the city centre with the Sachsenhausen. The Iron Bridge has been standing for more than one hundred years. It offers great views of the Frankfurt skyline. 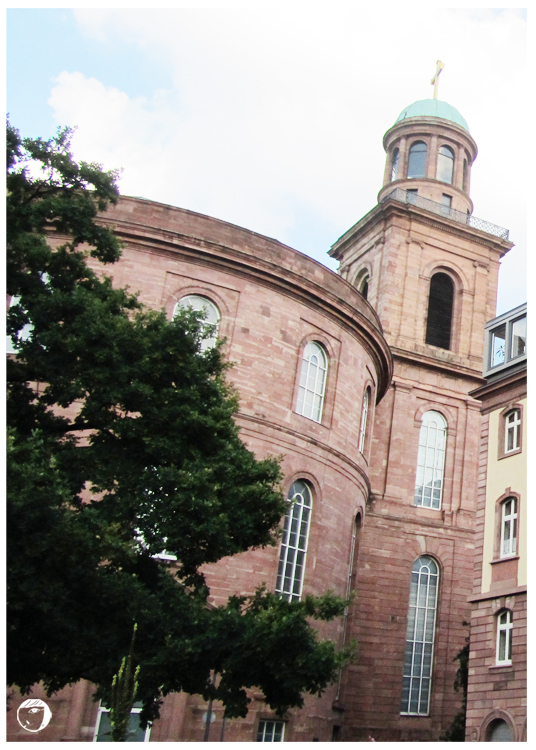 On the opposite side of the Main River bank, another important landmark around is the St. Paul´s Church (Paulskirche). 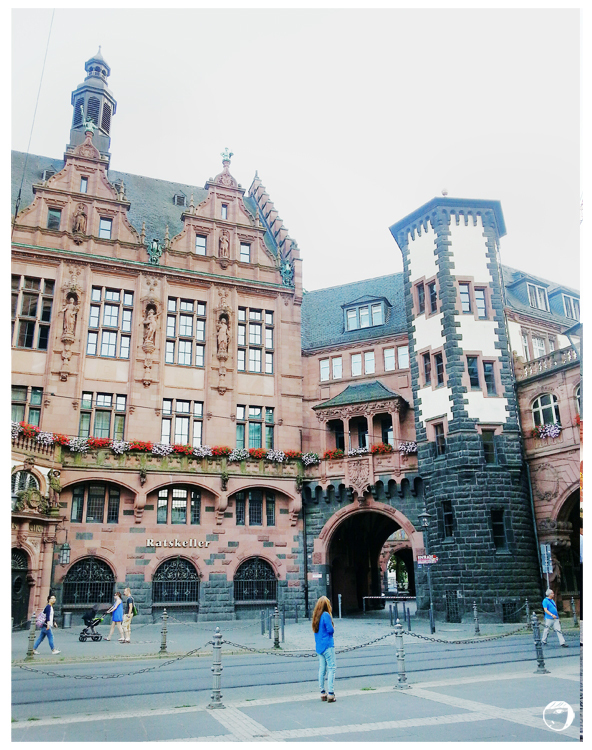 Made from red sandstone, the building was Frankfurt’s largest and most modern hall. It was used as the meeting place for the first German national assembly. Up until now, it stands as the symbol of German democracy. 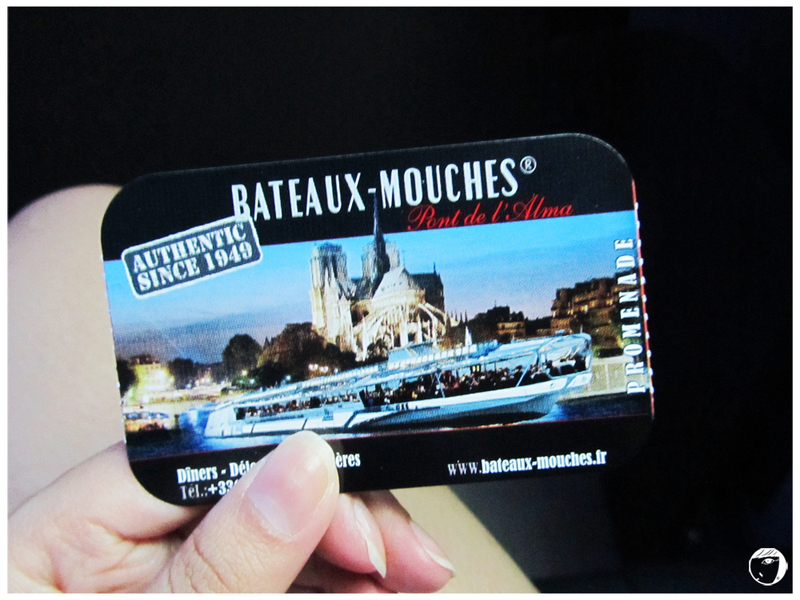 Bateaux Mouches are open excursion boats in Paris. 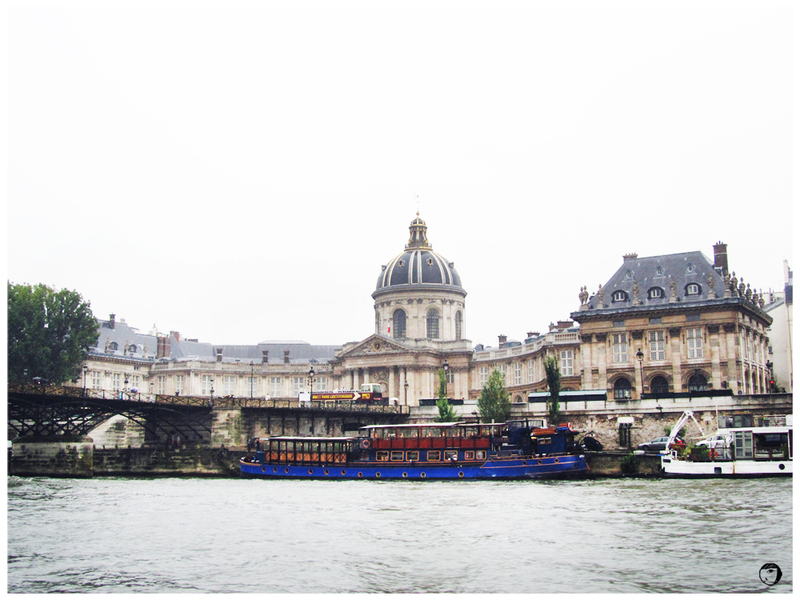 The cruise offers the visitors a view of Paris city from along the Seine river. 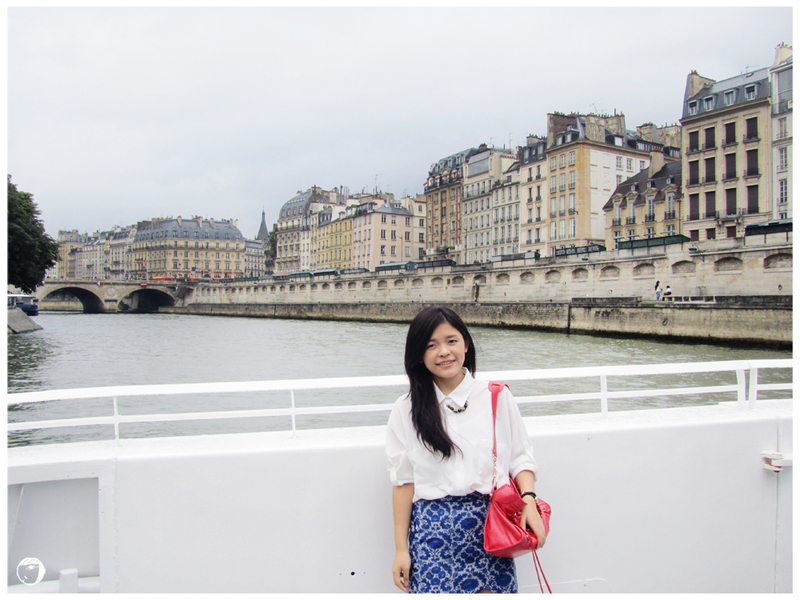 Second time visiting Paris, it was my second time cruising on the Bateaux Mouches. Instead of going at night, I went in the afternoon this time. And since it was summer, the sun sets later at 9PM. The boats are equipped with audio announcement systems, synchronized to the boat’s movement. The commentary provides informations about the sights. Not to worry about the language, because the the commentary goes in several different languages. There are upper and lower deck seats. Upper deck seats offers best and clearer views, except there are no shelters (if it rains) and it can be windy. The lower deck seats are indoor. 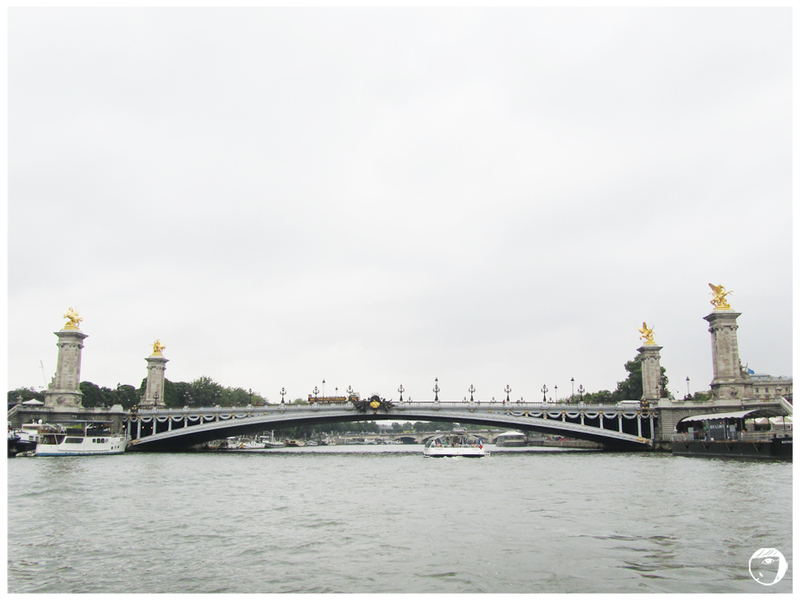 Some sights include the famous Eiffle, Notre dame Cathedral, Invalides, Musee du Louvre, Grand Palais and the list goes on. 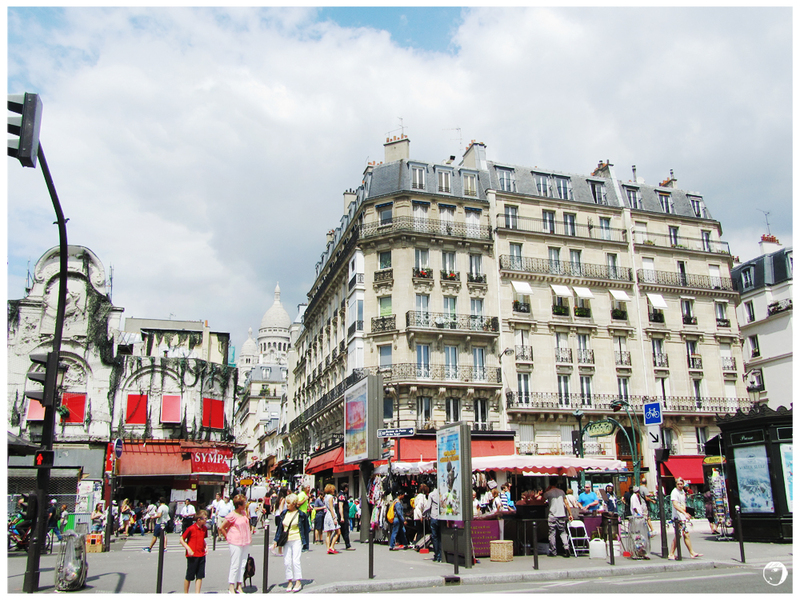 Certainly, the tours offer a pleasant and relaxing way to see the city. 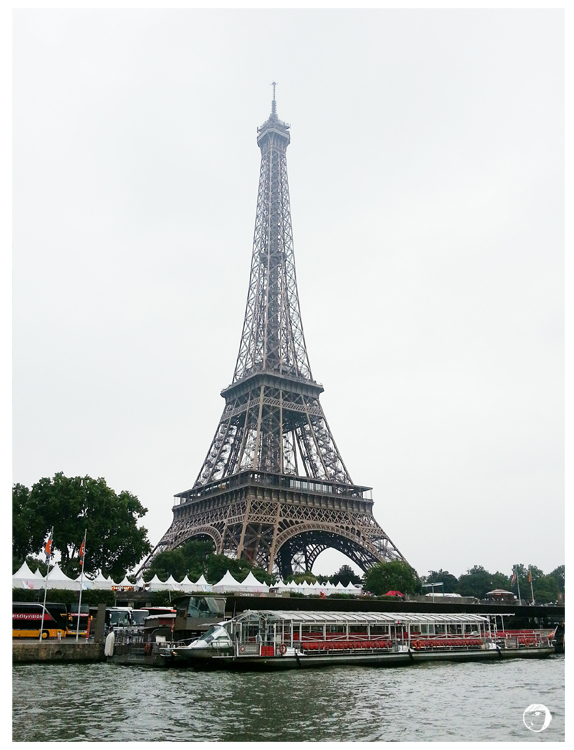 This worths and is recommended for those who has limited time to explore Paris. The city offers a different feel and view during the daytime and at night. During the daytime, you can see the architecture of the buildings clearly, whereas the night it offers romantic views with lights.